A new CPSC report has the leading hoverboard manufacturer spinning. Major hoverboard manufacturer Swagway is having some trouble getting its story straight, and the whole thing is starting to blow up in their faces. After a Consumer Products Safety Commission report declared hoverboards — 2015’s two-wheeled, not-actually-hovering mega-fad — unsafe, mostly because they tend to explode, Swagway emailed Mashable to say that their customers should probably step off their boards for the time being. 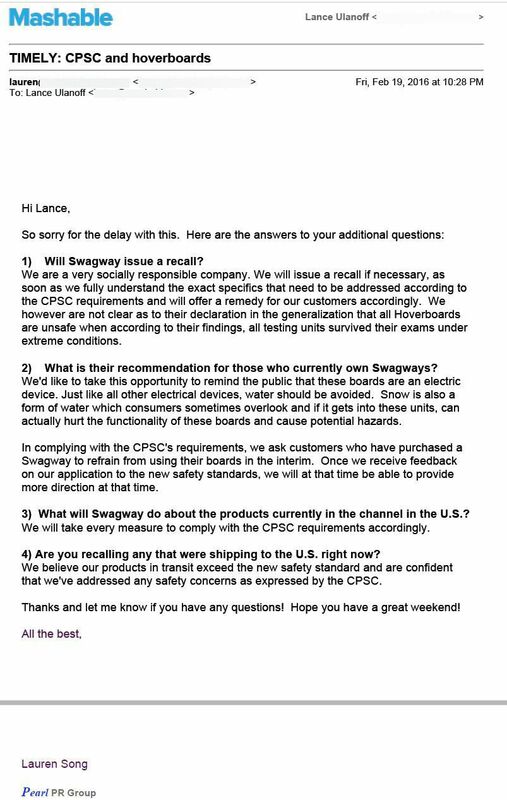 “In complying with the CPSC’s requirements, we ask customers who have purchased a Swagway to refrain from using their boards in the interim,” the company said in an email. Visual representation of Swagway's PR strategy. So far, Swagway has not issued a recall on any of their products, and maintains that their original hoverboard passes muster with the CPSC requirements. Still, with many boards running on explosive lithium batteries, it might be wise to stay off your hover board for the time being, as neither Swagway or any of the other major manufacturers have passed the voluntary certifications the CPSC recommends.